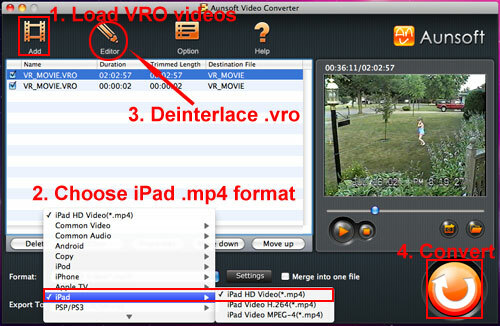 Home » Useful Guide » How to Play DVD Camcorder VRO on iPad without Losing Quality? How to Play DVD Camcorder VRO on iPad without Losing Quality? News: Find Free,limited-time free games for iPhone/iPad, just join http://aungame.com. It is said that Apple iPad covered most of the tablet market share at over 90%, and the uses of iPad cover many areas like proposal presentation, restaurant menu with iPad menu and personal entertainment. While you have DVD disc in VR mode from Panasonic or Sony DVD camcorders, you may notice that the VRO videos could not be synced via iTunes or stream to iPad. To play DVD camcorder VRO files on iPad, you just need a Panasonic/Sony VRO video converter to convert VRO to iPad supported video format like MP4. Aunsoft Video Converter for Mac is the recommended Mac VRO to MP4 converter on Mac computer, and it helps you deinterlace VRO files for playback on iPad. If you have VRO files and would like to play on iPad, Mac QuickTime, just follow the steps below to download recorded VRO videos to iPad without losing quality. Step 1. Import VRO files to Aunsoft Video Converter for Mac. Run Aunsoft Video Converter for Mac as the best Mac VRO to iPad converter, and click the "Add" button to import the .vro files for conversion. Alternatively, you can drag and drop the downloaded .vro files from Apple hard drive or DVD disc. Step 2. Choose iPad MP4 format. Click the "Format" option, and choose iPad > iPad HD Video(*.mp4) as output format. 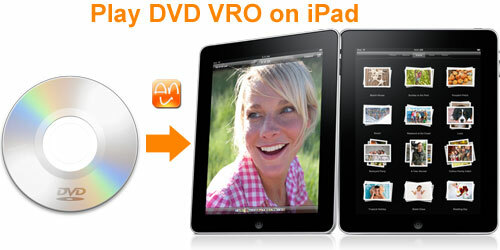 The mini-DVD VRO converter will convert VRO to iPad on Mac with best quality. Step 3. Deinterlace VRO for iPad. You may notice that there are lines when playing VRO on the converter, and the disc must be recorded in interlaced mode. To avoid the lines on output videos, just select a video clip and click the Editor button. Go to the Effect tab and check the box for deinterlacing. Click the apply to all button to deinterlace all the loaded .vro videos. Step 4. Convert VRO to MP4 for iPad. Click the convert button under the preview window, and the Mac VRO to iPad converter will start converting VRO to Apple iPad MP4 for playback. When the conversion is done, just import the output .mp4 videos to iTunes library and sync to iPad, or stream to iPad via WiFi network. For playing Blu-ray movies, DVD movies, TiVo videos, MKV videos on iPad, you can download the free trial Aunsoft iMedia Converter for Mac to watch movies with best quality. If you want to convert vro to avi or mpeg on Windows computer, just try the Windows version of Aunsoft Video Converter.